Blackshirt assault battalions, known as “M” battalions, contained the organization’s picked troops, and had seen extensive combat in Greece and on the Eastern Front. The new divisions would have the pick of these picked men, or at least those who had survived the destruction of the Italian Eighth Army in Russia. It would also draw carefully-screened recruits from the Fascist youth movement, the Giovanni Fascisti (“Young Fascists”). The division would serve as a palace guard for Mussolini and his Fascist regime, giving the Party a politically reliable force stronger than any the increasingly-suspect Royal Army could muster. Heinrich Himmler, head of the Waffen SS among other Nazi institutions, enthusiastically endorsed the plan and gave his personal guarantee that the required munitions would be provided. Reluctantly, the Royal Army assigned the new division to the training ground at Campagnano near Rome. 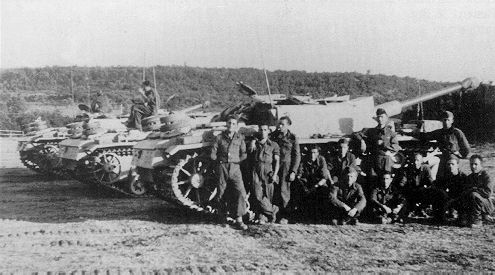 The regular army had been struggling to acquire enough vehicles and tanks for the 135th “Ariete II” Armored Division then forming in Ferrara, and could only issue the hopelessly inadequate Italian-made M15/42 tanks to their new division. The generals bitterly resented the assignment of such prized new weaponry to the Blackshirts, and slowed the new division’s development at every opportunity. Blackshirt tankers show off their M.
The new division would be known as the 1st Blackshirt Armored Division “M,” apparently for “Mussolini” though Il Duce’s full name was never formally used. The division sign was the script M in Mussolini’s handwriting that had been the insignia of the M Battalions. Mussolini named Console Generale Alessandro Lusana to serve as the division’s commander. Lusana, an early convert to Fascism, had commanded a Blackshirt legion in Ethiopia and again in Yugoslavia, where he won a Silver Medal for Bravery and formulated Italian occupation policy. The division, upgraded from the battle group originally proposed by Mussolini, followed a table of organization that mixed Italian and German practice. It had the battalion-sized “Leonessa” armored group of three companies: one of PzKpfw IVG medium tanks, one of PzKpfw IIIN medium tanks, and one of StuGIIIG assault guns. The infantry component consisted of two motorized regiments (“Tagliamento” and “Montebello”), each of two “M” assault battalions and one heavy weapons battalion. Instead of a conventional artillery regiment, the Blackshirt division had a regiment of two battalions each equipped with a dozen German-made 88mmm dual-purpose guns. In what may be the only example of the Germans fulfilling a promise to an ally regarding equipment deliveries, the promised tanks, vehicles and weapons arrived in Campagnano in May 1943. 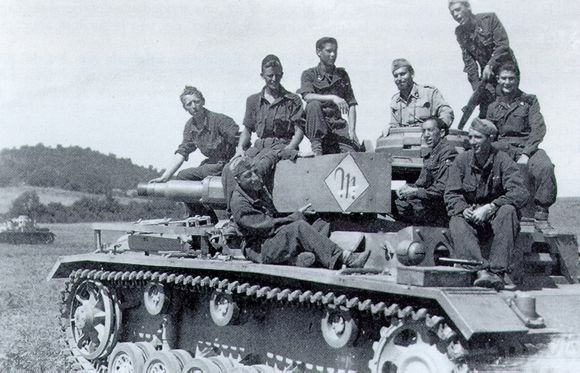 The armaments went to Italy exactly when scheduled despite the concurrent buildup for the Kursk offensive in Russia, a sign of how politically important the Nazi regime viewed the formation of a politically-reliable guard for Mussolini. The Blackshirts began training under the eyes of their German instructors, but progress remained slow as few of the Blackshirts had any experience with vehicles of any sort, let alone tanks, while the Army refused to transfer experienced tankers and mechanics to the MVSN outfit. Mussolini's boys and their assault guns. When Mussolini was removed from power on 25 July Lusana ordered his troops to remain in their barracks, a move supported by his senior officers. Marshal Pietro Badoglio nonetheless fired Lusana two days later and replaced him with Gen. Giorgio Carlo Conte Calvi di Bergolo, son-in-law of King Vittorio Emanuele III and the most reliably royalist general in the Italian army. The division, renamed as the 136th “Centauro II” Armored Division, received an infusion of regular army troops. When Italy signed an armistice in September 1943, Calvi reported that his division still could not be considered politically reliable. Nevertheless, Calvi’s corps commander ordered him to march to the aid of the 21st “Granatieri di Sardegna” Infantry Division, Italy’s equivalent of a royal guard formation, then engaged in heavy fighting with the German 3rd Panzer Grenadier Division around the Porta San Paolo. Whether Calvi ignored the order, or never received it, became the subject of heated and still unsettled controversy. Whatever the reason, the division did not fight the Germans and they were able to peacefully confiscate its tanks, weapons and vehicles for distribution to their own troops. Our Blackshirt Division supplement for Panzer Grenadier adds 88 new pieces depicting the M Armored Division in their own special color scheme, and ten scenarios set in Tunisia against the Americans and the British, battles which of course never took place. Don’t wait to put Blackshirt Division on your game table! Join the Gold Club and find out how to add it to your collection! When the Allies landed on Sicily in July 1943, the Axis garrison included three battalion-sized Blackshirt legions, each assigned to an Italian infantry division. These melted away quickly during the Allied attack, even faster than the rest of their divisions. But these troops, while wearing the black shirt of the MVSN, were not combat veterans like the men of the M Armored Division. Benito Mussolini urged the Italian and German commands to deploy “his” division to Sicily to stop the invaders, but the division’s German training mission reported that it was not yet ready for action. Even had training proceeded smoothly, the division would have been unlikely to be ready in time to see action on Sicily. But Mussolini thought it ready, and since Mussolini is always right, we have a variant for Bitter Victory to add his favorite division to the game. The M Armored Division is represented by three units, the Leo tank regiment and the Tag and Mon motorized infantry regiments. The appear as an optional 24-26 July reinforcement, with all three units arriving on a single die roll of 4 or greater and at a cost of -7 victory points. They are treated as Italian units for all game purposes, but the Axis player suffers -3 victory points for each motorized regiment lost and -4 victory points if the tank regiment is lost. However, the Axis player games one victory point each time the three units attack together and capture an Allied-occupied hex without loss to themselves (Mussolini is very happy when “his boys” are successful). You can order Bitter Victory right here.